Many people think of joints, bones, and the skeletal system when they think of chiropractic, but in fact, the muscles also play an integral part in supporting the body. The muscles are layers and interwoven work to move and stabilize the spine, facilitate the movement of the body’s joints, and aid in respiration. When there is pain within this system, chiropractic can be a very effective treatment. 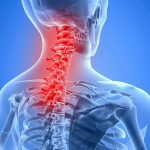 More patients are turning to chiropractic care to treat a variety of painful conditions because it does not use addictive pharmaceuticals with unpleasant side effects; it is completely natural. Chiropractic can also keep patients from requiring surgery in many cases. So when it comes to myofascial pain and trigger points, this form of treatment is often considered optimal. In simple terms, myofascial pain is simply pain in the muscles. When you break down the word, “myo” means muscle and “fascia” refers to the connective tissue that are interwoven throughout the body. The pain originates in specific trigger points that are located in the muscles and fascia at various areas of the body. The pain can range in intensity from mild and annoying to severe and debilitating. Trigger points are tightened, hypersensitive spots that can be located in any muscle. Different people may have different trigger points. It isn’t like specific lower back pain or neck pain which occur in specific areas of the body. Trigger points can vary from person to person. When trigger points form, they become nodules or spots that exist in one of the muscle’s taut bands. The patient may experience a variety of symptoms including pain, weakness, burning, tingling, and other symptoms. What often makes trigger points difficult to locate is that they cause what is known as referred pain. 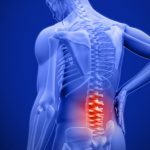 In other words, the person may experience the pain at the exact location of the trigger point, or the pain can be referred to other areas in the body. 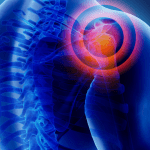 Referred pain usually has fairly consistent pain patterns so it can be traced to the origin – eventually. Around 85% of the pain that individuals experience is attributed to myofascial pain. The trigger points determine whether the pain is chronic or acute. It is a condition that is very common. How do Trigger Points Form? Trigger points form when the muscle undergoes trauma of some type. The trauma can come from disease, accidents, work related conditions (from persistent, repetitive motion), and sports injuries. Activities or habits that place a repetitive, long term strain on the muscles can also cause trigger points. Poor posture, improper ergonomics, and repetitive movements are the most common of these types of activities. Emotional and physical stress are often identified as causes of irritating trigger points. Chiropractic care is often a preferred treatment for myofascial pain due to its effectiveness and drug free approach. Patients who undergo treatment will usually experience a dramatic decrease in their pain level or it will be eliminated altogether. They also enjoy increased strength, flexibility, and range of motion. With continued chiropractic care, they will find that they have more endurance for work and recreational activities and even sleep better. It should be noted that sleep disruptions are a common complaint associated with myofascial pain. Overall, chiropractic can give patients with myofascial pain a better quality of life with decreased incidence of injury. They are often able to lower their pain medication or eliminate it altogether. Because chiropractic is a whole-body approach, patients learn healthy habits including diet, exercise, and mental wellness. Most of all, they can live with less pain or no pain at all. massage was absolutely the best. I am a former Chiropractor and Dr. Denke keeps me going. Staff is the best --always making you feel special and welcome. They are the very best! I do CrossFit style training and some gymnastics, and Dr. Joe Denke helped me get through a gymnastics related soft tissue issue very quickly. He and his staff are always an absolute pleasure. I will definitely be visiting regularly for maintenance!! Will definitely refer my clients as well! Best staff and doctors around. Now able to exercise without pain from before. i did one session and I'm going back I felt like they were very professional and listen to my needs. Friendly and knowledgeable! Highly recommended! I had never been to a chiropractor before in my life so I was so scared because of how much pain I was in but they made me feel very comfortable, everyone was so sweet and helpful and honestly I had been suffering from sciatic pain for over a year..the day before I walked in the office i couldn't even walk and day after I went in, I didn't have any pain at all it's been almost a week and I still have no pain..I will definitely go back if i ever need to thank you guys.. I have not felt this good in over a month! I cannot say enough positive things about this establishment. Every employee was super kind, my massage and adjustment/therapy were exactly what I needed to continue to push through my prep! I initially went to Dr. Denke with my wife for a car accident we both were injured in. His whole team were great to us and made us feel like family. They did so good that i decided to continue going to them. I recently changed positions at work and overdid it and needed my back adjusted and some muscle work. Once again they did a great job. I will recommend Dr Denke and Select Spine and Sports to anyone. I had my first visit with Dr. Denke today for my torn pectoralis minor muscle. Everyone was so welcoming! So happy my friend referred me because I actually felt like it was a knowledgeable visit and they made me confident that I can do what I need to at home for recovery. I look forward to my next visit with him! I was super nervous about coming here because I've never seen a chiropractor but Dr. Denke, the massage therapist and physical therapist are all amazing. I thought I was going to have to live with the back pain due my back injury and buldging discs but everyday I leave here improved. They are super informative and take the time to explain everything to you! Great massage and awesome chiropractor! Taped my shoulder up too. I will be coming back for more maintenance. Words can't express the help I've received from Dr.Denke and his team. They are so kind and thorough. They have shaped my accident recovery and continued to build my endurance to find healing. I'm forever Greatful. Joe Denke and staff were very thorough, diagnosed the issue immediately and have helped me work through my injury with physical therapy, massage therapy and chiropractic adjustments. I would highly recomend Select & Sports Medicine! Everything there is first class service. Staff is great!! Staff is amazing! Highly recommend the sports massage! Feel relaxed and ready for my next run! Dr. Denke teaching the wonders of how stretching helps with proper form and endurance while relieving lower back pain associated with tight muscles. Came highly recommended by a friend and I’m so glad I decided to go. Love that he and his staff work on showing you how to correct small things and habits to make a big difference, not just a quick fix, but focused on long-term health and pain-free movement. � if you’re a runner, or any kind of athlete, with any kind of pain, come here! Wonderful staffs and Dr. Denke is very friendly and knowledgeable! Very impressed! The whole staff is amazing and very personable. They do not rush though your appointment and they make sure you have a clear understanding of your whole treatment process. Dr. Denke is litteraly the best chiropractor i have been to. I highly recommend them to everyone. I tell everyone at my job and at the gym about select spine and sports. Best chiropractor in town! Super friendly staff, and Dr. Denke takes his time with you and your needs. He doesn't rush your appointment, and he doesn't treat you as if you are just another number in line to see him. I see him on a weekly basis, and he and his staff definitely do not disappoint! I have been using Dr. Denke for 2 months! My back pain is greatly improving. He and his staff are amazing and friendly. Dr. Denke made a believer in chiropractic medicine out of me. After an injury from a car accident, I sought care. He not only assessed me quickly, he scheduled imaging and coordinated care with a spine and pain management doctor. I will continue to use him even after this injury is resolved. This is the first chiropractor I’ve ever visited after hearing great things from friends. I now come here weekly and have never been disappointed! Always come out feeling so relaxed, staff is amazing and really spends time with you, talking and listening. Dr. is great and I love that they want you to get well with exercise, stretching and good healthy choices for a full recovery not just a quick fix to keep you returning! Professional with a smile and style! Thank you! *DISCLAIMER: Like all medical treatments results may vary from patient to patient.